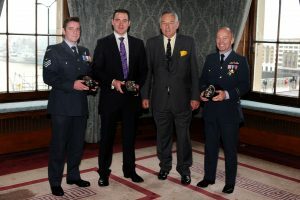 An RAF rescue crew have been recognised for their skill and gallantry in the rescue of a fisherman lost overboard in the South Atlantic, at a national awards ceremony held by the Shipwrecked Mariners’ Society. On 28 July 2014, the crew of ‘Rescue 01’ of 1564 Flt, 905 EAW, Mount Pleasant, Falkland Islands was tasked to go to the assistance of a fisherman lost overboard from the fishing vessel Venturer off East Falkland. Jake Bowman-Davies, based in Milford Haven, was awarded an ‘Individual Commendation’ by the Society for his courage and determination, which Sir Ben Ainslie described as impressive after reading the citation. A Pembrokeshire fisherman has been recognised at a national awards ceremony held by the Shipwrecked Mariners’ Society for his leadership, cool headedness and excellent judgement in saving the lives of four men from their sinking vessel. On 12 February 2015 Jake Bowman-Davies successfully orchestrated the abandonment of his fishing vessel in order to save the lives of his crew. 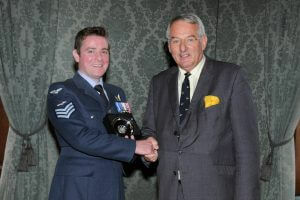 Sergeant Dan Allanson QGM, an RAF Sea King winchman based on the Falkland Islands, was awarded an ‘Individual Commendation’ by the Society for his courage and determination. An Ipswich man has been recognised at a national awards ceremony held by the Shipwrecked Mariners’ Society after his skill and courage saved a life. Sergeant Allanson was the Winchman on ‘Recue 01’, an RAF Sea King from 1564 Flt, 905 EAW, Mount Pleasant in the Falkland Islands, when it launched on the night of 28 July in response to a call for assistance to locate a man lost overboard from the fishing vessel Venturer. 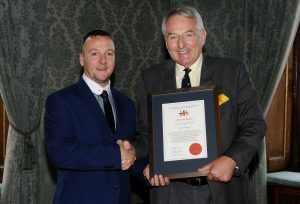 Chris Macdonald of Solent Towage, based in Fawley, Hampshire, was awarded an ‘Individual Commendation’ by the Society for his courage and determination, which Sir Ben Ainslie described as impressive after reading the citation. A Hampshire man has been recognised at a national awards ceremony held by the Shipwrecked Mariners’ Society after his heroism and quick thinking saved the life of a crew member trapped aboard a capsized vessel. On 30 March 2015, Chris Macdonald, a Solent Towage seaman, leapt into the water with a sledge hammer in order to smash the window of an upturned tug in order to save his trapped colleague. Honorary Agent, Superintendent Tracey Stephens, was presented with the Lord Lewin Award at the Charity’s AGM and Skill and Gallantry Awards. The award is presented to the Charity’s volunteers who have given exceptional service. A woman from Hull has been recognised for her dedication and long-standing service as a volunteer for the Shipwrecked Mariners’ Society at its national awards ceremony in London. 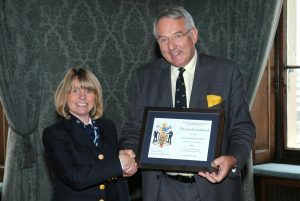 Superintendent Tracey Stephens has been an Honorary Agent for the Society in Hull since 2010. In that time she has supported hundreds of fishermen and their dependants. That support ranges from helping them to get grants for essential household items, advice on benefits and debts, to taking funerals and seeking wider charitable assistance. 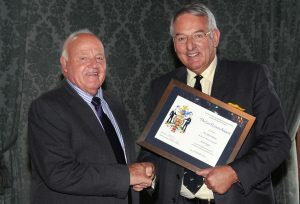 Honorary Agent, John Wason, 80, was presented with the Lord Lewin Award at the Charity’s Skill and Gallantry Awards. The award is presented to the Charity’s volunteers who have demonstrated exceptional service. A Dorset fisherman has been recognised for his dedication and long-standing service as a volunteer for the Shipwrecked Mariners’ Society at its national awards ceremony in London. Mr John Wason has been an Honorary Agent for the charity for 24 years, looking after a large collecting mine, in Lyme Regis, which generates donations in the region of £400 each year.